A single click solution to get your maps from desktop to the Cloud! Publishing GIS projects with traditional GIS tools is not easy. You have to set up your own server, being that a server from a commercial vendor or open-source, and follow that with maintaining the server and services, uploading your data from desktop, reconfiguring maps and generating tiles to be optimized for the Web, not to mention mobile and tablets. All these are, for the most part, daunting and/or expensive tasks. GIS Cloud already gives you a way to easily build and publish your maps on the Cloud, but there are still lots of maps and projects sitting on your desktops. Of course it is possible to upload all that data to GIS Cloud, but then you would have to go through the process of creating and setting up those maps once again. The GIS Cloud Publisher for ArcMap extension enables you to publish your maps from ArcMap to GIS Cloud with only one click. It automatically uploads your data, symbology, layer structure and spatial references. The idea is that what you see in your desktop GIS is instantly replicated on your GIS Cloud account. Once your maps and data are on GIS Cloud, they are easily published to the public or embedded into your website/blog without a need for having your own servers. 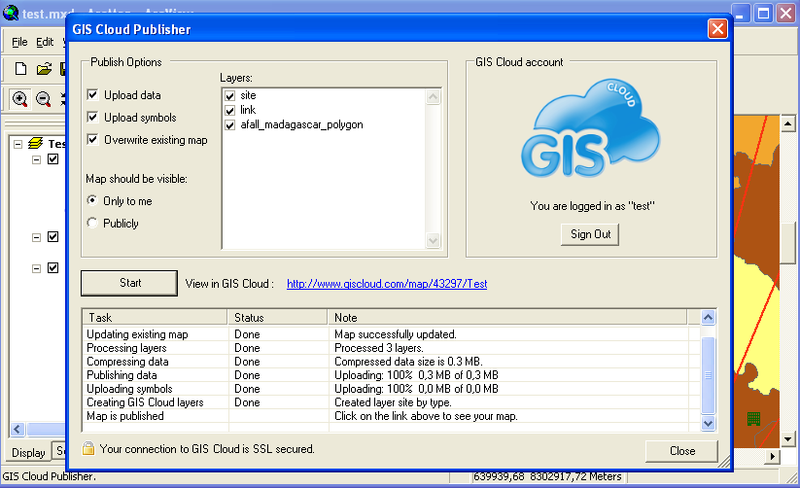 GIS Cloud is a leading cloud platform delivering simple and easy to use geo platform, applications and solutions. Company is focused on providing geo services for visualizing and publishing spatial data through its innovative HTML5 mapping technology. The mission of GIS Cloud is not only to supplement desktop solutions, but to extend and enrich their capabilities through the potential cloud computing provides. With a strong focus on using latest web and cloud technologies, company believes in moving traditional GIS industry into to the world of modern web based software.